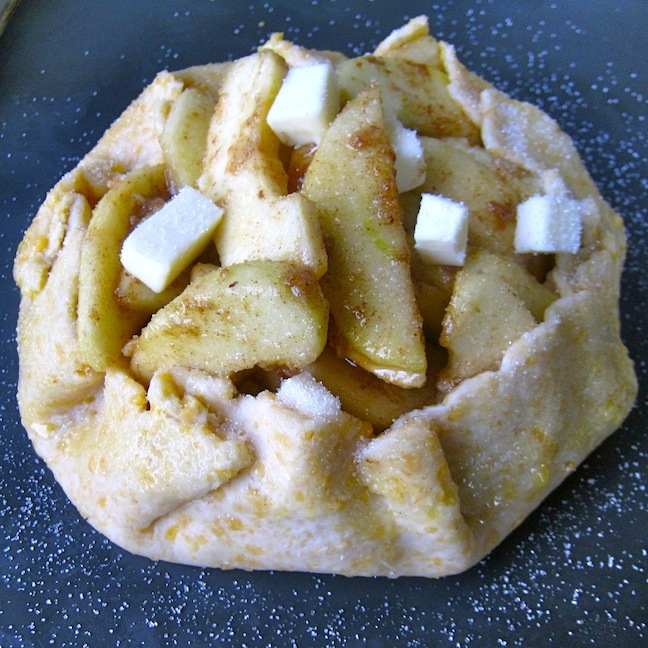 This entry was posted in Sweets (Dolci), Vegetarian and tagged Apples, Baking, Food, Italian, Pie, Recipes by ChgoJohn. Bookmark the permalink. I love apple thingamajigs. Don’t they usually call them “crostata?” There’s another word for them, too. They also work with pears, figs, peaches in the summer (any firm fruit). “Galette.” That’s the other word. Love it!!!! Thanks for the smiles. Happy holidays! Love the overhead picture of the pie on the blue and white plate- way to go. Thanks, Roger. You’ve made my day! You’re so funny!! I do believe they refer to these Thingamajigs as a crostata!! or rustic pie as I’ve also heard it called. I love making my pies this way too, being a swinging single myself I don’t need a huge pie and that I think it just looks way cooler this way!! Not so stuffy as a traditional pie…and I guess you can take that literaly. While I have my go to apple pie recipe, I simply must try yours as after all that testing and eating this has to be one awesome apple thingamajig!!! You say crostata and I say tomata! After calling ’em thingamajigs for 2 years, we’ll never get used to a new name. I certainly hope you plan to share you pie recipe. The World needs more apple pie recipes! What a great recipe. My family never did the cheddar cheese with apple pie thing, but Katherine’s did. They would just put a slice of cheese on apple tart. I need to try the cheese in the crust. This a gorgeous recipe. Thanks, Greg. cheddar cheese & apple pie wasn’t something Mom served either. Uncle, Zia’s husband, liked it and I tried it because of him. I liked it, although I also liked apple pie with ice cream and/or whipped cream. Let’s face it: I just love apple pie and thingamajigs. This is exactly my type of pie. I am not a big crust eater, and this rustic rendition with a thinner crust has my attention! I also love it that you don’t add a lot of sugar AND that you use granny smith apples (my all time favourite—in fact, I have one here for lunch!). It’s difficult to get a scale on your thingamajig (oh my, that sounds very bad, sorry) but I bet these would be wonderful as smallish individual servings. A perfect ending to an Autumn meal. Eve, if you like thin crust and not much sugar, check out my Gravenstein Apple Pie recipe at “The Kale Chronicles.” http://thekalechronicles.com/2011/09/03/gravenstein-apple-pie/ You can even make it with Granny Smiths, although I don’t recommend it. Cheers! Sharyn. P.S. If you are good at adjusting proportions, it’s easy to roll the crust into the right size for “thingamajigs,” too. Certainly no ned to apologize, Eva. For all the tens of thousands of blogs on WordPress, we are a remarkaby small community. These things are bound to happen. As for individual thingamajigs, they can easily be made. It isn’t a runny dessert so you have plenty of leeway with the crust. Needless to say, I love ’em! This looks beautiful! I keep meaning to try one of these thingmajigs. I think I’ve seen them as galettes. 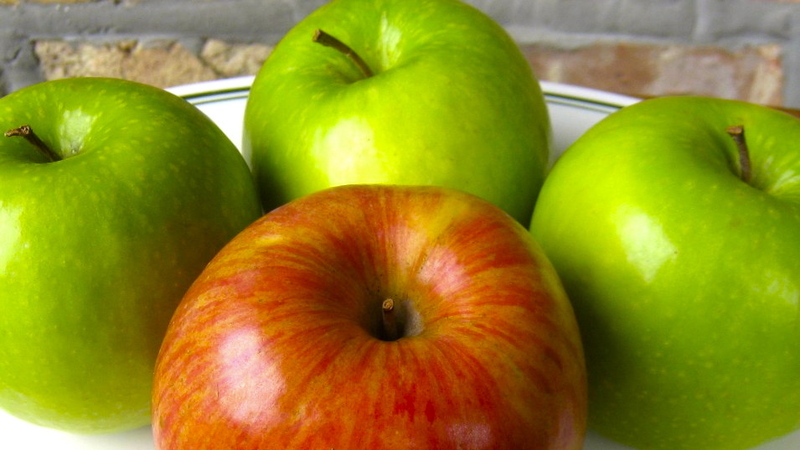 Love your tart to sweet apple ratio, and how you don’t add a lot of sugar. Can’t wait to see your pie recipe! See, Stephanie? Crostata, gallettes, open-faced pies, open-faced tarts, and/or rustic pies. This is where the confusion began and where thingamajigs were born. I’m with Zia now and tomorrow we’re baking apple pie. Once last run-through for pictures and to get her final approval of the recipe. Fingers crossed! This pie looks perfect for our Canadian Thanksgiving… I love the photo with the bits of butter all over it… mmmmm! Ah, yes. Butter. The “other” food group and the one that makes any Thanksgiving delicious. Have a wonderful Thanksgiving Holiday! Delicious as usual. I’m so glad I’m your unofficial taste tester. QA has its benefits. I’ll likely make this myself sometime. Thanks, Chris. As you can see, I’m behind replying. The internet connectivity issues are alive and well here. We’ll talk later. I’ve never added cheese to my apple pie crust. I’m intrigued! Look forward to seeing your recipe. I figure it’s just better to call this a thingamajig, as I can never remember that they’re called crostadas. Congrats on the awards! Loveliest thingamajig I’ve ever seen, apple or otherwise 🙂 Here’s to more pie! Thank you so much, Judy. And I agree, more pie! In fact, pie for every one! Thank you so much for the eloquent shout-out John! It’s truly appreciated. 🙂 And your apple pie looks amazing!!!! I too do the mix of tart and sweet apples, leaning more heavily on the tart varieties. I’ve never tried an open-faced pie like this before, but it does look so darn good. I have no doubt I would have to sneak a pinch each time I walked past it! 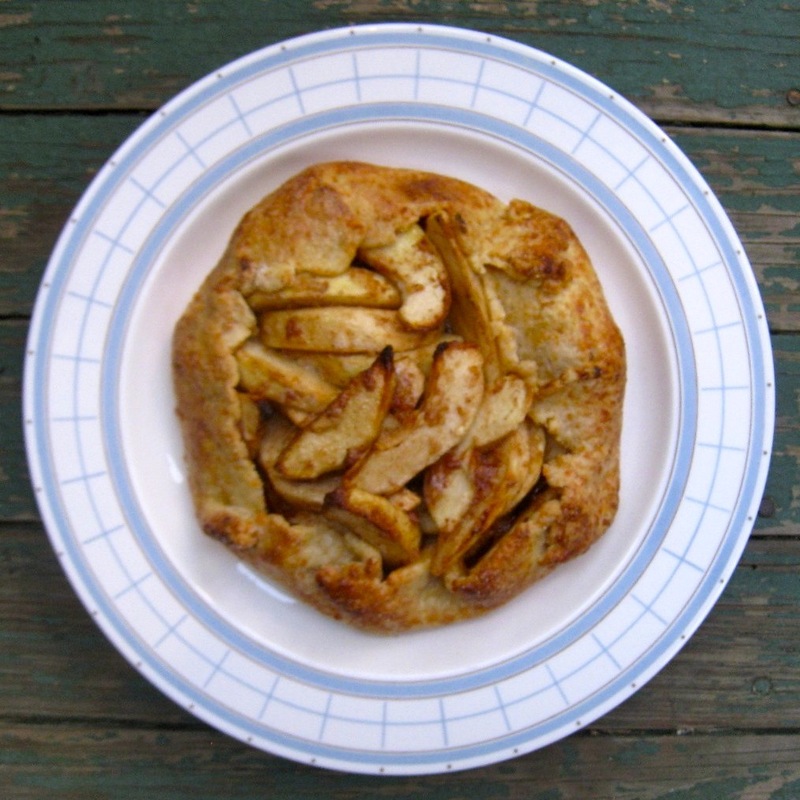 And speaking of apple pies…I believe there’s an apple pie contest in Bucktown next weekend. 🙂 YUM! You’re welcome, Kristy. I truly appreciate what you’re doing, introducing your children to different foods by getting them involved in its preparation. My parents gave me that gift and I’m forever thankful. And, yes, the problem with one of these thingamajigs, being open-faced, is that it is nearly impossible to walk passed it without snagging a slice of apple off of the top. Then you need to take another to “even it out.” Then another …. You had me at thingamajig…classic and it totally makes sense to me. Great looking recipe and I like the creativeness of the cheddar cheese. I’ll be sure to share this one with the now ‘resident’ baker in the house Liz. Thanks, Jed, but I feel congrats are in order for he “now ‘resident'” phrase. Good for you both! Now, make the baker some spaghetti aglio e olio! For many, it’s the glue that binds the home together.OK. That’s a bit much but the dish is really good and she will love it. What ever you call it…’thingamajig’ will do fine…I’ve never added the cheese to the crust dough..interesting! I make an apple cake more than anything else..easy peesy! But this is a great idea! Although I do enjoy cake — it wouldn’t be a birthday without one — I very much prefer pie. It must be the fruit. Whatever the reason, this being apple season means I’m in heaven! Thank you! Sorry if I’m a little behind with my replies and comments. I’m with Zia and the internet is not as accessible as it is at my home. It may take a while but I’ll get caught up. Oh I love your thingamajig – just heavenly! Oh my, saying it like this sounds a tad wrong but hey you know what I am talking about…right? If this is how good your thingamajig is, I can only imagine how good your whatchamacallit it like! Have a great day ChgoJohn. Thank you, mandy. I’m visiting my Aunt and we’ve both had a good chuckle at how popular our thingamajig name is. If either of us had a good memory, we’d be dangerous!And you, too, have a great day! Your photographs of the apples and the thingamajig in stages are just wonderful. You really capture a nice light that enhances the subject, making everything enticing! I am taking a bag of apples from the Farmer’s Market to the grandchildren this weekend. Your recipe inspires me to try something new! Thanks, Ruth. Sounds like you’ve got a weekend of fun planned. I think God invented baking just to make sure that a Grandmother’s place is secure in her grandchildrens’ eyes. Cookies! Don’t forget to bring or bake cookies! And have a wonderful time! John, this looks gorgeous – rather like the crostata I make. I’ve never used vinegar in my crust – is that part of a secret family recipe? We bought a peck of apples at, well, the Apple Festival in Liberty a week ago. I believe some will turn up in a Thingamajig! Hm, Ritchey will come in tired and hungry tonight and that cinnamony smell will greet him at the door! I made this Saturday – it’s a lovely recipe! Tried to add my photo for you, but I couldn’t paste it in this reply. And, yes, Ritchey was putty in my hands – but then he usually is! He’s such a sweetheart! Thanks for a great recipe! 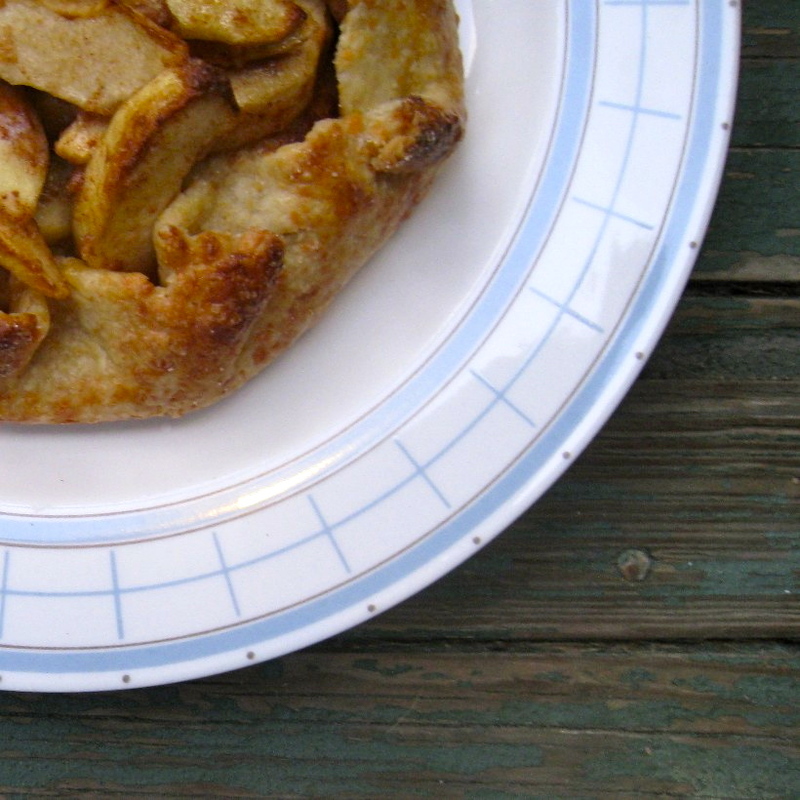 In some areas here, it’s common to serve apple pie with a slice of apple pie. This is just another way to add cheddar cheese flavor to a pie. I made one for Zia and both she and her son loved it. That’s a good enough recommendation for me :). Excellent and creative version of an apple pie!! !…and the picture is stunning!!! You’ve made a great job John!!!!! Thank you for your kind words! Zia & I both love these for dessert or a snack and it is good to see them so well-received. We had grandma’s slab apple cake in my family. I’ll have to try your “Thingamajig,” even if I’m embarrassed to say it. It reminds of that IHOP breakfast special, the Rooty Tooty, Fresh ‘n Fruitie! Well, in the comments, people have called it a crostata, rustic pie, and gallette, while I’ve also heard it called an open-faced pie or open-faced tart. Calling it a thingamajig ended the confusion between my 89 year-old Aunt and myself. You, on the other hand, may call it whatever you like. I promise we won’t mind. Thanks for dropping by and taking the time to comment! Thanks, Christina. I like them because they’re smaller and a snap to make. Besides, when there’s one in the oven, your kitchen will smell great! It is such a delicious recipe, and speaks of your talents! Mind? I think it’s an honor, Judy. I love your site and this is quite the compliment. Thank you so much! Same back to you John!! Your blog is gorgeously delicious! Just made your thingamajigger today and it was great! I used my go to pie crust recipe from Cook’s Illustrated when I made it but next time I’ll give yours a go. Thanks for the recipe! Your post is why I love cool weather. A warm house & the smell of apple thingamajig 😉 (Although whenever I read “thingamajig” I can’t help thinking “Thing 1 and Thing 2” lol) I must admit I’m intrigued by the vinegar in the crust. I read somewhere that acid makes the crust more tender and flaky? As cold as our weather can get, a pie or casserole in the oven makes it easier to endure. The kitchen smells fantastic.